Goldenyan glistens with purrfection. Meow meow. Truly priceless. In Whisper's dream the anime, Goldenyan is a bit vain; it states it can only shine in certain places since it is Gold-plated. It also leaves when Katie summons it with her Yo-kai Watch, Similar to Robonyan, it says "I'll be back" when it leaves. Yo-kai Medallium Bio: Goldenyan glistens with purrfection. Meow meow. Truly priceless. 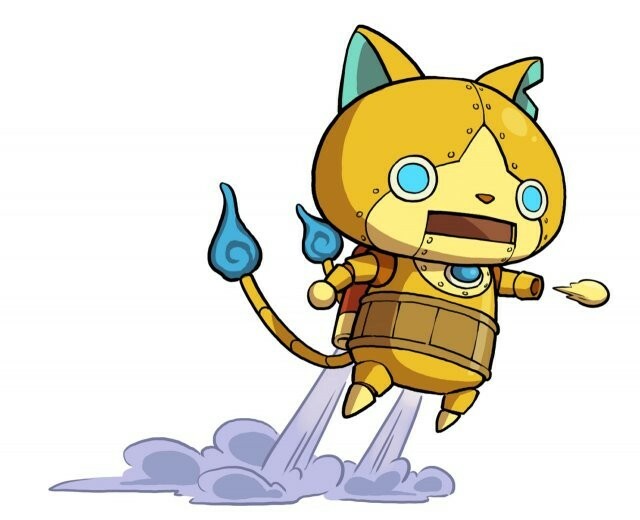 A gold-plated robotic Cat Yo-kai. It has big sky blue eyes, an orange nose, and dull blue inner-ear. It has a wide opened mouth and pale yellow muzzle and chest. A big blue sphere rests in the center of the chest. Where his arms begin is a single piece of brown material, matching the pale brown band around the stomach. A jetpack is visible on the back, while the tail flames are blue. It´s appearance is almost identical to Robonyan´s. It speaks with a high pitched voice, almost sounding like a female's. Despite only appearing in a dream, Goldenyan has its Yo-kai Medal registered in the Recap Time of said episode, along with Shadow Venoct.